Calling community workers, educators, teachers, artists & hip hop enthusiasts. 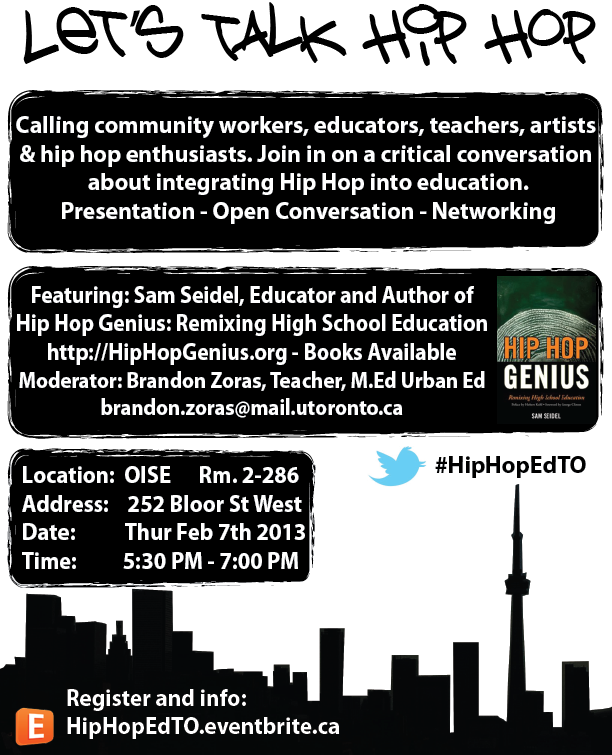 Join in on a critical conversation about integrating Hip Hop into education. Format will be a short presentation by Sam Seidel followed by open conversation. We will have time to make connections to allow for future collaborations. Bring business cards, flyers, contact info with you. Sam will have copies of his book for sale or you may purchase here. Room Capacity is 35 People. This event is designed to be a conversation of Hip Hop and education. If ticket is sold out please add to waiting list and I will email you as soon as a space opens.